Winter annuals, biennials, or short-lived perennials, 10-60 cm; fibrous-rooted, caudices simple. Stems erect to basally ascending (green proximally), proximally villous to villoso-hirsute, distally loosely strigose to hirsute, eglandular. Leaves basal (persistent) and cauline; basal blades oblanceolate to obovate or spatulate, 15-110(-150) × 4-25(-30) mm, margins serrate or crenate to pinnately lobed, faces hirsute to villous, eglandular; cauline blades becoming oblong, gradually reduced distally (reduced to bracts or 0 proximal to arrays, clasping to subclasping). Heads (1-)4-16(-50) in corymbiform arrays (from branches distal to midstem). Involucres 2.5-4 × 4.5-10 mm. Phyllaries in (2-)3-4 series (sometimes basally connate), strigose to hirsuto-villous, eglandular or sparsely minutely glandular. Ray florets 100-150; corollas usually blue, sometimes white to pink, 4-6 mm, laminae not coiling or reflexing. Disc corollas 1.5-2.8 mm. Cypselae 0.6-0.9 mm, 2-nerved, faces sparsely strigose; pappi: outer of setae, inner of 10-15 bristles. 2n = 18. Flowering (Feb-)Mar-Jun. Sandy sites, shell rock, roadsides, ditches, fields, areas of pine flatwoods; 0-15 m; Fla., Ga., N.C., S.C., Va.; West Indies (Bahama Islands). Erigeron quercifolius is primarily of the Atlantic coastal plain. Putative records from Alabama westward to Texas are based on specimens of E. philadelphicus or E. tenuis. Erigeron tenuis sometimes closely approaches E. quercifolius in overall appearance; it is more closely related to E. strigosus. Convergent plants of E. tenuis differ from E. quercifolius in their non-clasping cauline leaves, lanceolate (versus oblanceolate to obovate) phyllaries, and slightly longer cypselae (1-1.2 mm versus 0.6-0.9 mm). Resembling no. 3 [Erigeron philadelphicus L.], but ±villous-hirsute, the hairs usually shorter, those of the upper part (to 1/2 or even more) of the stem sometimes appressed; stems slender, 1-4(-6) dm; basal lvs oblanceolate to obovate, sinuately lobed to subentire, 1-14 נ0.5-4 cm; cauline lvs ±reduced, sometimes clasping; heads 1-many, the infl more nearly naked than in no. 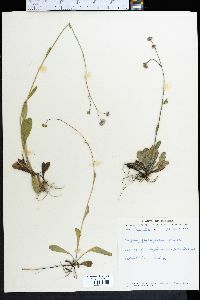 3; invol 2.5-4 mm, viscid-villous, the bracts darker than in no. 3; disk 5-10 mm wide; rays 100-250, to 5 נ0.5 mm, blue or light blue-lavender, varying to sometimes white or seldom pinkish; disk-cors 1.5-2.5 mm; pappus-bristles ca 10-15; 2n=18, 36. Moist, sandy places and pine woods; coastal plain from Va. to Tex.